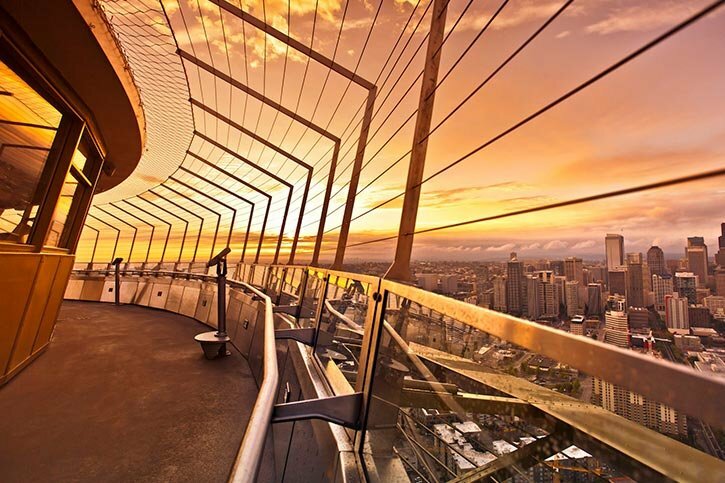 From soaring views to pop culture, Seattle’s attractions while varied, all have one thing in common, the ability to make your city break awesome! If you’re planning a trip to this amazing city, keep on reading as we discover 20 things to in Seattle! The Seattle Center is home to the Space Needle and several other attractions, and is linked to the Downtown Westlake Center by the Seattle Center Monorail! This historic landmark reaches top speeds of 45 miles per hour as it weaves through the skyscrapers of the city, between destinations. The Museum of Pop Culture is a museum dedicated to music, science fiction and pop culture. It’s a colorful museum that is interactive and truly fascinating. Learn about the history of Nirvana, horror movies, the Seahawks and so much more at MoPOP. Built in 1962, the 605 foot tall Space Needle is iconic as the symbol of Seattle. Be blown away with views of the city skyline, Elliot Bay, Mount Rainier and the Cascade Mountains from the observation deck. 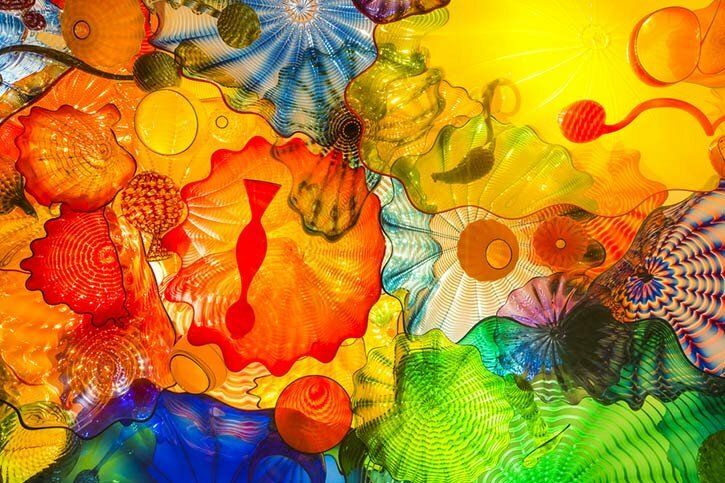 The Chihuly Garden and Glass Museum is dedicated to the work of Dale Chihuly, who was introduced to glass blowing when studying at the University of Washington. The museum is home to his most comprehensive collection of art to date, and throughout the galleries, you will be truly blown away by the sculptures on display. The Seattle Art Museum is the largest museum in Seattle and dates back to the 1930s. Featuring a large collection of artwork from various geographic regions, it is truly a must see. On-site, we recommend you also visit the Olympic Sculpture Park which is an outdoor extension of the museum that is open to the public. The Pacific Northwest is one of the top dance companies in the world and they offer a variety of classical shows and modern shows. If you’re thinking of trying something really different on your trip, or if you are celebrating a special occasion, a visit to the Ballet is a must! The Pacific Science Center is a family friendly museum where the lessons of science come to life! Discover galaxies near and far, butterflies, creatures and so much more in this fascinating museum. No trip to Seattle is complete without a visit to Pike Place Market. Discover iconic attractions such as the gum wall, Rachel the Piggy Bank and the original Starbucks, as well as over 225 local artisans and food providers. Pike Place Market also offers amazing views of Elliot Bay, making it the perfect spot for an afternoon stroll. The Seattle Aquarium is located on the waterfront at Pier 59 and it is a must do if you are visiting Seattle with the family. Discover and learn about various sea creatures from salmon to otters in this exciting aquarium. 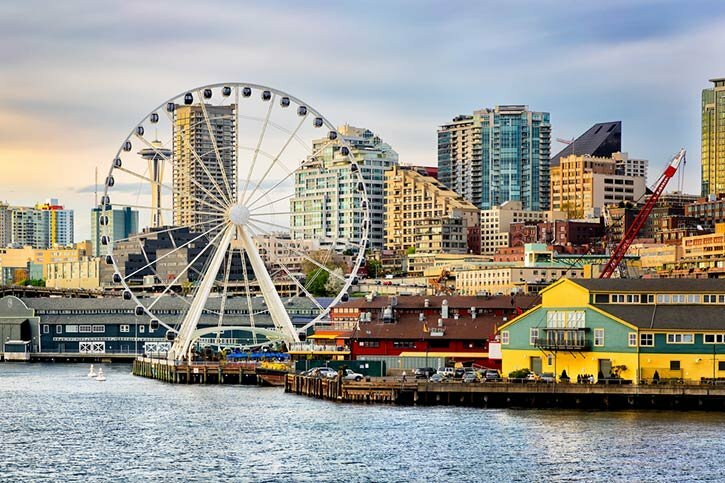 Located at Pier 57, the Seattle Great Wheel is another fantastic way to take in the Seattle skyline. Built in 2012, the Seattle Great Wheel’s air-conditioned gondolas give you the chance to enjoy views of the city, the water, mountains and horizon. The Seattle Central Library is one of the city’s most distinct buildings. The structure boasts enough glass to easily cover five football stadiums and if you head to the 10th floor, you can enjoy the most incredible light-filled reading room that offers amazing views over Elliott Bay. The Museum of Flight is home to one of the USA’s largest air and space collections. Explore and discover some incredible aviation miracles such as a Boeing Lunar Rover, an Air Force One and also a NASA space Shuttle trainer tour, as well as flight simulators. Iconic from the show Grey’s Anatomy, a trip on board one of the 22 Washington State Ferries across Puget Sound is a must. Enjoy breath-taking views from board your cruise to nearby areas of Bainbridge Island or Bremerton. If you’re planning a trip to Seattle, we highly recommend you take in a sporting event! Check out the Seattle Mariners at the Safeco Field. Or, if football is more your thing, check out a Seattle Seahawks game at the neighbouring CenturyLink Field. To learn more about either team, why not take a behind the scenes tour in either, or both stadiums! The Starbucks Reserve Roastery & Tasting Room is a special Starbucks experience that has been described as Willy-Wonka-esque. Enjoy exclusive beverages, various brewing methods, discover a coffee library and so much more. A must for any coffee aficionado. 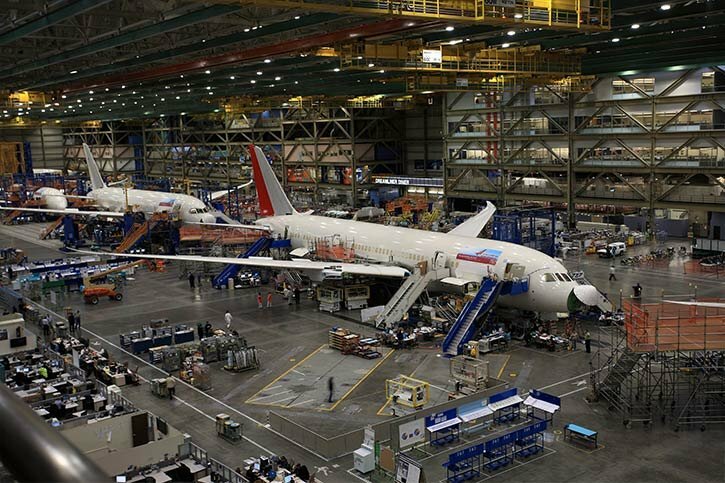 This incredible experience involves a tour of the working Boeing Factory, which is the world’s largest building by volume. See 747s, 777s and even Dreamliner’s in the making at this bucket list attraction. On the tour, you can also learn about airplane advancements, jet-fuelling, in-flight entertainment systems and so much more! South Lake Union is a neighborhood located northeast of downtown and it offers a variety of seaplanes, boats and floating homes, which were featured in the movie Sleepless in Seattle! It’s a really great spot to visit during your holiday. Pioneer Square is Seattle’s original downtown and it is home to many beautiful old buildings which were built in Romanesque Revival style. One of the most exciting things you can do in Pioneer Square is take a tour underground, which is home to the city’s first buildings. Above ground, be sure to check out the variety of hip shops and restaurants, as well as Waterfall Garden Park. The Chinatown district of Seattle is a must visit. Walk beneath the ornate Chinatown Gate and explore this incredible neighborhood where you can enjoy the most amazing cuisine as well as attractions such as the Seattle Pinball Museum. The Museum of History & Industry, known as MOHAI, is another really great museum that offers a unique mix of smart history, technology, quirky artifacts and a really interesting day out. As you can see, Seattle really is a city that offers so much to see, do and enjoy. 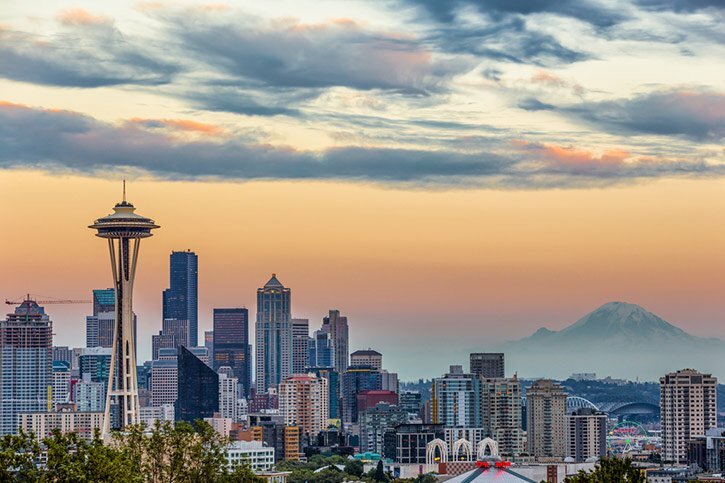 If you’re planning a holiday to Seattle Washington, you can contact our award winning travel experts on 01-8173562 or via the contact form below. Packages from only €699pp. T&Cs apply. Licenced by the Commission for Aviation Regulation, TA 0443”.